Visitors to Belarus must obtain a visa from one of the Belarusian diplomatic missions unless they come from one of the visa exempt countries or if their visa had been approved in advance for collection on arrival. Armenian (2003), Azerbaijani (2007), Georgian (1992), Kazakhstani (2002), Kyrgyzstani (2002), Moldovan, Russian (2002), Tajik (2002), Ukrainian (2010) and Uzbekistani (2006) citizens have never needed a visa to gain access to Belarus. Visa-free agreements were however signed with those states, the date of entrance of valid agreements into force is in brackets. 2019 European Games ticket holders for matches will be able to enter Belarus without a visa from 10 June to 10 July 2019. 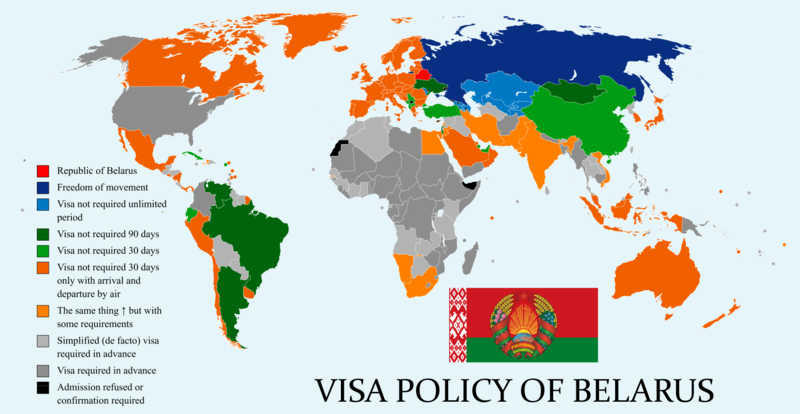 No visa is required for Belarus for holders of either diplomatic or other official passports of Bangladesh, Bolivia, Bosnia and Herzegovina, Cambodia, Chile, Egypt, El Salvador, Guatemala, Hungary, India, Indonesia, Iran, Laos, Myanmar, Nicaragua, North Korea, Oman, Peru, Romania, Singapore, Slovakia, South Africa, South Korea, Sri Lanka, Syria, Thailand, Uruguay and Vietnam and for holders of diplomatic passports of Poland. All visitors are required to have adequate health insurance. Visa exemption agreements for all passports was signed with Saint Kitts and Nevis on 19 October 2018 and it is not yet ratified. Visa waiver agreements for holders of diplomatic and service passports were signed with Algeria and Colombia and they are yet to come into force. A consensus between Belarus and Uruguay on mutual visa-free access was reached in November 2017. A draft agreement on mutual abolition of visas was proposed by Belarus to the United Arab Emirates in November 2017. Plans for introduction of digital visas and travel authorization system were announced by Belarus in July 2018. Foreign visitors who are citizens of designated countries are allowed to enter Belarus without a visa through the Minsk National Airport, except for flights departing to and from Russian airports. The allowed length of stay stay is up to 30 days, with mandatory registration for stays exceeding 5 days in length. Visitors must also depart from Minsk National Airport, departure by train (for example) is not permitted. The number of visa-free entries is unlimited. The decree "On establishing a visa-free order of entrance and departure of foreign citizens" was signed by the President of Belarus on 9 January 2017 and it entered into force on 12 February 2017. It was amended by another presidential decree on 24 July 2018, which entered into force on 27 July 2018. 1 — Including non-citizen residents of Estonia and Latvia. 2 — Only if in possession of a multiple entry visa (i.e., a 'C' or 'D' type visa) from a European Union or Schengen area member country, an entry stamp from one of these countries and a valid air ticket with departure from Minsk National Airport. The EU residence cards are not accepted for this purpose. In September 2017 it was announced that Belarus is planning to extend the visa-free access to 10 days and to other checkpoints. In November 2017 statistics were published showing that 54,000 foreigners visited Belarus through the visa-free program, mostly citizens of Germany, Poland, Italy, United States and the United Kingdom. There is a plan to extend the allowed stay to 30 days during the 2019 European Games in Minsk. Plans to introduce a visa-free tourist zone between the Grodno and Brest regions and an extension of its visa-free travel period to 15 days for visitors entering and exiting the country through Minsk National Airport have also been confirmed by the Tourism Department of Belarus' Sports and Tourism Ministry. Belarus has a visa-free regime for foreign hikers and cyclists, going to the Belovezhskaya Pushcha National Park for a period of up to 10 days. The system was first introduced in June 2015 and allowed up to three days stay until 1 January 2018 when it was extended to 10 days. A pass for a visa-free visit can be obtained electronically and is only valid for the territory of the national park. Entry is possible through the following checkpoints with Poland - Brest - Terespol, Domachevo - Slawatycze, Peschatka - Polowce, the simplified border checkpoint Pererov - Bialowieza, the railway station Brest (Terespol), and the Brest Airport. The list of eligible nationalities is the same as that for the visa-free program through the Minsk National Airport, with the addition of Honduras and the Sovereign Military Order of Malta. In April 2019 a plan was announced to extend the visa-free zone to Lida District, Shchuchyn District and Voranava District. The Foreign Admissions Division at the Minsk International Airport of the Consular Directorate of the Ministry of Foreign Affairs issues visas on arrival if the support documents were submitted not later than 3 business days before expected date of arrival. If the reason for arrival is serious illness or death of a close relative or family member visa support documents can be submitted at the moment of application for an entry visa. Fees are significantly higher than at the consulates. Belarusian citizens can enter all of the countries whose citizens are granted permanent visa-free access to Belarus without a visa except for the United Arab Emirates. Among the countries granted short visa-free access under a pilot program Belarusian citizens are granted visa-free access to Antigua and Barbuda, Indonesia, Malaysia, Nicaragua, Panama, Peru, Saint Vincent and the Grenadines, Seychelles and Vanuatu. Wikivoyage has a travel guide for Belarus. ^ "Interactive map". State Border Committee of the Republic Of Belarus. Retrieved 9 December 2017. ^ "Visa-free travel (general information)". Ministry of Foreign Affairs (Belarus). Retrieved 9 December 2017. ^ "СОГЛАШЕНИЕ о безвизовом передвижении граждан государств Содружества Независимых Государств по территории его участников" [Agreement on visa-free travel of citizens of the states of the Commonwealth of Independent States on the territory of its participants]. A single register of legal acts and other documents of the Commonwealth of Independent States (in Russian). Executive Committee of the Commonwealth of Independent States. Retrieved 10 December 2017. ^ "Соглашение между Правительством Союза Советских Социалистических Республик и Союзным Исполнительным Вече Скупщины Социалистической Федеративной Республики Югославии о взаимных поездках граждан" [Agreement between the Government of the Union of Soviet Socialist Republics and the Federal Executive Council of the Federal People's Assembly of the Socialist Federal Republic of Yugoslavia on reciprocal travel of citizens]. Information Channel on Technical Regulation in Russia (in Russian). Techexpert. Retrieved 10 December 2017. ^ "Пагадненне памiж Урадам Рэспублiкi Беларусь i Урадам Рэспублiкi Куба аб узаемных бязвiзавых паездках грамадзян" [Agreement between the Government of the Republic of Cuba and the Government of the Republic of Belarus on mutual visa-free travel]. National Legal Internet Portal of the Republic of Belarus (in Russian). National Center of Legal Information of the Republic of Belarus. Retrieved 9 December 2017. ^ a b "Соглашение между Правительством Республики Беларусь и Союзным Правительством Союзной Республики Югославия об отмене виз" [Agreement between the Government of the Republic of Belarus and the Federal Government of the Federal Republic of Yugoslavia on the abolition of visas] (PDF). Department of Information and Public Relations Ministry of Internal Affairs of the Republic of Belarus (in Russian). Ministry of Internal Affairs (Belarus). Retrieved 10 December 2017. ^ "Bilateral Issues with Foreign Countries - Belarus". Ministry of Foreign Affairs (Serbia). Retrieved 9 December 2017. ^ "Соглашение между Правительством Республики Беларусь и Правительством Боливарианской Республики Венесуэла об отмене виз в национальных паспортах" [Agreement between the Government of the Republic of Belarus and the Government of the Bolivarian Republic of Venezuela on the abolition of visas in national passports]. National Legal Internet Portal of the Republic of Belarus (in Russian). National Center of Legal Information of the Republic of Belarus. Retrieved 9 December 2017. ^ a b "Соглашение между Правительством Республики Беларусь и Правительством Черногории о взаимных поездках граждан, заключенное путем обмена нотами 30 сентября 2009 года" [Agreement between the Government of the Republic of Belarus and the Government of Montenegro on reciprocal travel of citizens, concluded by exchange of notes from 30 September 2009] (PDF). Department of Information and Public Relations Ministry of Internal Affairs of the Republic of Belarus (in Russian). Ministry of Internal Affairs (Belarus). Retrieved 10 December 2017. ^ "Об установлении безвизового порядка въезда, выезда и осуществления транзитного проезда (транзита) через территорию Республики Беларусь граждан Государства Катар" [On the establishment of a visa-free entry, exit and transit transit through the territory of the Republic of Belarus of citizens of the State of Qatar]. National Legal Internet Portal of the Republic of Belarus (in Russian). National Center of Legal Information of the Republic of Belarus. Retrieved 9 December 2017. ^ "Nationals of following countries are exempted from visa to enter Mongolia (as of may 2017)". Consular Department. Ministry of Foreign Affairs (Mongolia). Retrieved 9 December 2017. ^ "Visa Free Travel between Belarus and Turkey". Consulate General of the Republic of Belarus in Istanbul. Ministry of Foreign Affairs (Belarus). Retrieved 9 December 2017. ^ "Regimen sin visado para los ciudadanos del Ecuador" [Visa-free regime for citizens of Ecuador]. Embassy of the Republic of Belarus in the Republic of Ecuador (in Spanish). Ministry of Foreign Affairs (Belarus). Retrieved 9 December 2017. ^ "Belarus-Israel visa abolition agreement to enter into force on 26 November". Belarusian Telegraph Agency. 27 August 2015. Retrieved 9 December 2017. ^ "Об установлении безвизового порядка въезда и выезда отдельных граждан" [On the establishment of a visa-free entry and exit procedure for individual citizens]. National Legal Internet Portal of the Republic of Belarus (in Russian). National Center of Legal Information of the Republic of Belarus. Retrieved 9 December 2017. ^ "No visa requirements between Belarus and Brazil as from November 25". Belarusian Telegraph Agency. 24 November 2016. Retrieved 9 December 2017. ^ "Belarus enters into visa-free agreement with Brazil, Macau". Y-Axis. 25 November 2016. Retrieved 9 December 2017. ^ "Об установлении безвизового порядка въезда и выезда иностранных граждан" [On the establishment of a visa-free entry and exit order for foreign citizens]. National Legal Internet Portal of the Republic of Belarus (in Russian). National Center of Legal Information of the Republic of Belarus. Retrieved 9 December 2017. ^ "La Supresión de Requisitos de Visa en Pasaportes Ordinarios" [The Suppression of Visa Requirements in Ordinary Passports]. Embassy of the Republic of Belarus in the Republic of Argentina (in Spanish). Ministry of Foreign Affairs (Belarus). Retrieved 9 December 2017. ^ "Belarus, Hong Kong to start visa-free regime next month". Xinhua News Agency. 19 January 2018. Retrieved 19 January 2018. ^ "25/2001 Z.z. Dohoda medzi SR a Bieloruskom o vzájomných bezvízových cestách - OZNÁMENIE Ministerstva zahraničných vecí Slovenskej republiky" [25/2001 Z.z. Agreement between the Slovak Republic and Belarus on reciprocal visa-free travel - NOTICE of the Ministry of Foreign Affairs of the Slovak Republic] (in Slovak). ASPI. Retrieved 30 December 2017. ^ "Указ Президента Республики Беларусь от 29 сентября 2003 г. № 428 О применении Соглашения между Правительством Республики Беларусь и Правительством Республики Польша о взаимных поездках граждан" [Decree of the President of the Republic of Belarus of September 29, 2003 No. 428 On the Application of the Agreement between the Government of the Republic of Belarus and the Government of the Republic of Poland on Mutual Travel of Citizens]. BUSEL (in Russian). Retrieved 9 December 2017. ^ "Visiting Belarus without Visa". ^ "Plans for visa-free travel between Belarus, Uruguay". Belarusian Telegraph Agency. 15 December 2017. Retrieved 9 December 2017. ^ "Belarus sends draft agreement on mutual abolition of visas to UAE". Belarusian Telegraph Agency. 30 November 2017. Retrieved 11 December 2017. ^ "State Border Committee: No limit on number of visa-free entries to Belarus". Belarusian Telegraph Agency. 10 January 2017. Retrieved 9 December 2017. ^ "Беларусь вводит пятидневный безвизовый режим для граждан 80 стран" [Belarus introduces visa-free entry for nationals of 79 countries] (in Russian). Press Service of the President of the Republic of Belarus. 9 January 2017. ^ "Information on visa-free travel via the checkpoint "Minsk National Airport"". Ministry of Foreign Affairs (Belarus). Retrieved 9 December 2017. ^ "Об установлении безвизового порядка въезда и выезда иностранных граждан" [The decree "On establishing a visa-free order of entrance and departure of foreign citizens"]. National Legal Internet Portal of the Republic of Belarus (in Russian). National Center of Legal Information of the Republic of Belarus. Retrieved 9 December 2017. ^ "Five-day visa-free regime to enter into force in Belarus on 12 February 2017". Belarusian Telegraph Agency. 11 January 2017. Retrieved 9 December 2017. ^ Belarus extends visa-free entry to 30 days, Belarusian Telegraph Agency, 24 July 2018. ^ Information on visa-free travel via the checkpoint "Minsk National Airport", Ministry of Foreign Affairs of Belarus. ^ List of states, Ministry of Foreign Affairs of Belarus. ^ "Visas to the Republic Of Belarus". Embassy of the Republic of Belarus to the United Kingdom of Great Britain and Northern Ireland. Ministry of Foreign Affairs (Belarus). Retrieved 9 December 2017. ^ "Number of visa-free visitors to Belarus reaches 52,000". Belarusian Telegraph Agency. 25 September 2017. Retrieved 9 December 2017. ^ "Over 54,000 visa-free tourists visit Belarus in 2017". Belarusian Telegraph Agency. 28 November 2017. Retrieved 9 December 2017. ^ "Belarus considers launching visa-free program for 2019 European Games". Belarusian Telegraph Agency. 29 November 2017. Retrieved 9 December 2017. ^ Stanev, Yoan (2018-06-29). "Belarus Extends Visa-Free Travel Period". Emerging Europe. Retrieved 2018-06-29. ^ a b c d "Комментарий к Указу № 462 от 26 декабря 2017 г." [Commentary to Decree No. 462 of December 26, 2017] (in Russian). Press Service of the President of the Republic of Belarus. Retrieved 30 December 2017. ^ "Regulations About the procedure for foreign citizens visiting the National Park "Belovezhskaya Pushcha"". Administration of the President of the Republic of Belarus State environmental institution «National Park „Belovezhskaya Pushcha“». Retrieved 9 December 2017. ^ "Visa-free trips to Belovezhskaya Pushcha as from 12 June". Belarusian Telegraph Agency. 11 June 2015. Archived from the original on 30 January 2016. Retrieved 9 December 2017. ^ "Visa-free travel time up to ten days in parts of Brest Oblast, Grodno Oblast as from 1 January". Belarusian Telegraph Agency. 2017-12-26. Retrieved 3 January 2018. ^ "Visa-free travel program in the tourism and recreation zone Brest and the Augustow Canal Park". Embassy of the Republic of Belarus in Canada. Ministry of Foreign Affairs (Belarus). Retrieved 3 January 2018. ^ "On establishing of visa-free regime of entry and exit of foreign nationals". Presidential Decree No. 318 of 23 August 2016. Retrieved 29 August 2016. ^ "Belarus government adopts Regulation on travel of foreign citizens to Augustów Canal park" (in Russian). Grodno Region Executive Committee, Department of Sports and Tourism. 2016-10-19. ^ "Grodno Visa Free". Grodno City Executive Committee. Yanka Kupala State University of Grodno. ^ "Particulars of issuance of entry visas at the National Airport Minsk". Ministry of Foreign Affairs (Belarus). Retrieved 9 December 2017. ^ "Tourism statistics for Belarus - 2013". imagebelarus.by. Retrieved 9 December 2017.